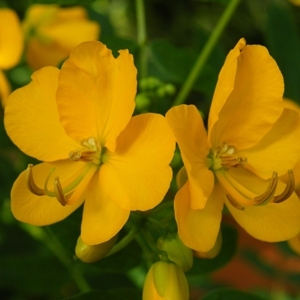 With its bright buttery yellow flowers, the Senna corymbosa really makes a statement in the sub-tropical house. Its masses of yellow, pea like flowers, give it a long season of interest and it really adds a splash of colour. Although tender, originating in Argentina and Uruguay, it can be placed outside in the summer, adding to any courtyard or Mediterranean garden scheme. Not content with just being ornamental, some species of Senna have played a major role in herbal and folk medicine for millennia, and is still a major item of national trade. Its purging effects are still used today, with £14 million being spent on laxatives in Britain alone! It can be grown outside in a frost free, sheltered spot, in full sun or under glass.